Deer Canyon is the second largest tributary of White Canyon in Natural Bridges National Monument, the largest being Armstrong Canyon, which contains one of the three bridges (Owachomu), and like most drainages hereabouts it is deep and confined, enclosed by tall walls and narrow benches of light-colored Cedar Mesa sandstone, and containing pools, potholes, boulders and short slot sections. 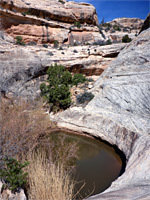 The drainage is not too overgrown and some parts consist only of rock and water; often with a narrow pool curving across a floor of fluted slickrock below overhanging cliffs liberally streaked with desert varnish. 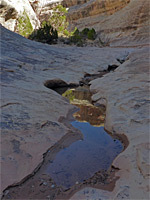 There is no path or recognized route though Deer Canyon though it can be explored for at least 1.8 miles, as far as a blocking pool, after passing two other significant obstacles, a rock-lined pool after 0.8 miles and an enclosed slot with potholes after 1.1 miles, passable via climbing to a bench above. Deer Canyon joins White Canyon from the northwest, 0.6 miles downstream of Sipapu Bridge, so the start point for the hike is the parking lot for the bridge trail; the half mile descent is consistently sleep, dropping down 500 feet to the valley floor, assisted by ladders in a couple of places. 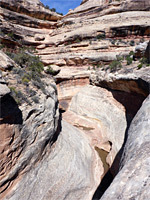 The canyon confluence is then reached via the connecting trail downstream, which after the bridge curves round one bend and cuts across an overgrown sandbank beside another, beneath a particularly impressive curved and streaked cliff to the south, then rounds a third, U-shaped bend to the junction with Deer Canyon. 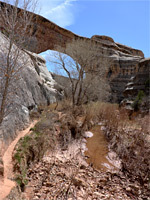 Map of Natural Bridges National Monument. 27 views of Deer Canyon. 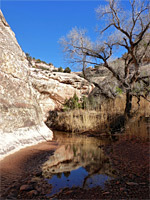 The lower end of Deer Canyon contains trees, bushes and grassy sandbanks, either side of a shallow streambed that may hold flowing water. 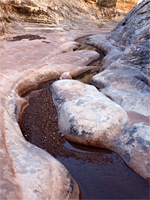 The drainage soon bends to the left, then right and left again; inside the middle bend are a few faint petroglyphs, at the base of a cliff behind a row of bushes. The vegetation lessens and after a few little potholes is the first bare rock section, leading to a more extensive, sandier stretch. 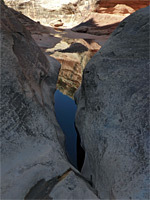 A longer pool is followed by another bend and then, after 0.8 miles, by a wide pool that narrows between rock walls, becoming unusually deep, maybe four to six feet, leading to a pour-off and chokestone. 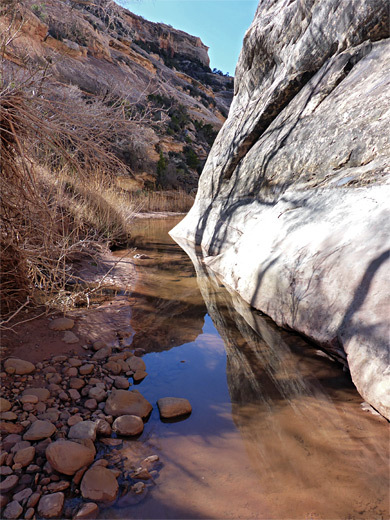 The pool can be waded, or stemmed, but the easiest bypass method is simply to walk over the slickrock to the right, up a steep slope and along a very narrow bench, at the junction of two strata. Soon after is a shallower pool beside a big cottonwood tree with another, deeper pool to one side, at the foot of an east side tributary, which ascends in a series of steps via wide, sloping falls. 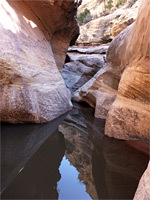 The main canyon continues to a group of big boulders, then some minor narrows with potholes and a curving channel into a watery slot. The first pool here can be waded or bypassed but others are deeper, enclosed and not easily surmountable. 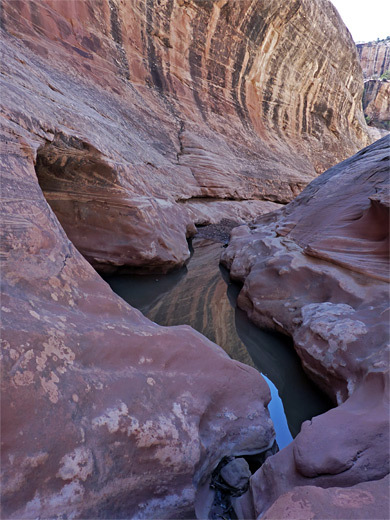 Instead, all the narrows can be avoided by walking up the tributary on the east side to a bench and along this for a few hundred feet, returning to the canyon floor just upstream of the slot. The next section is wider for a while then narrower once more, preceding a partial blockage formed by trees and boulders. Another tributary joins from the west, and just beyond is a wide, round-walled pool that has no simple bypass, though the steep rock on the left side may just be walkable. If not, this marks the end of the accessible section, 1.8 miles from White Canyon. After the pool the canyon opens out again and seems to have no more extended slots but plenty of brief narrow parts with pools and pour-offs.